Ready to trade your eyeglasses for contact lenses? Many people excitedly make an appointment to try contact lenses only to be told they shouldn't wear them. Several factors may or may not make you a good candidate. Your optometrist or ophthalmologist will perform a comprehensive eye examination and conduct certain tests to determine if contact lenses will work for you. While wearing contact lenses isn't a problem for most people, there are a few things that may make it difficult. Dry eye syndrome is one of the most common conditions that gets in the way of successful contact lens wear. In order to feel comfortable in contact lenses, a person needs to have ample amounts of healthy tear film. Human tears consist of water, oil, mucus, salt, natural antibiotics, vitamins, minerals and many other items. Every time you blink, you renew your tears and wipe a new layer of this complicated solution across your eye. Tears help keep contact lenses moist and lubricated. 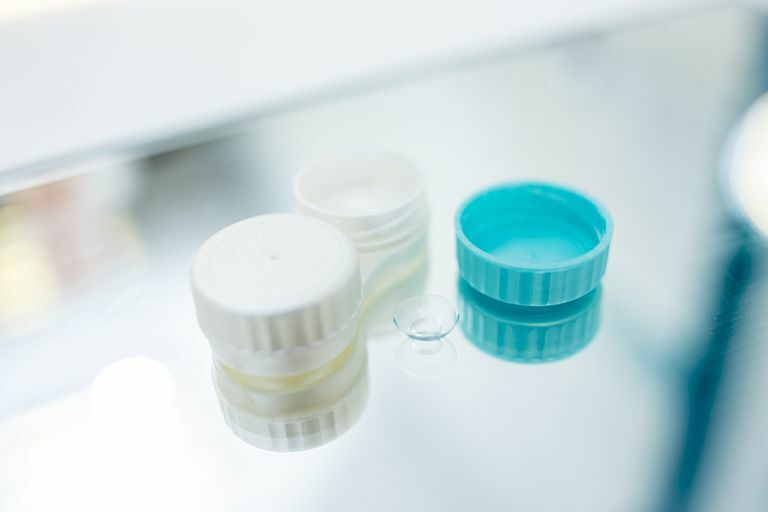 If tear film is lacking, the contact lens becomes dry or the surface of the lens may be exposed to the air. This will cause fluctuating, blurry vision and will cause the eye to feel dry. You may feel the contact lens in your eye or feel as if there is a piece of sand in your eye. Your eye may feel scratchy or burn. These symptoms may make leave your eyes feeling very tired after only a few hours of wearing contacts. Blepharitis is another common condition that reduces chance of success with contact lens wear. Blepharitis is an inflammation of the eyelids. While it can affect people of any age, blepharitis tends to occur more often in people with oily skin. Blepharitis is classified into two types: anterior and posterior. Anterior Blepharitis: Anterior blepharitis affects the outside of the eyelid where the eyelashes attach. Anterior blepharitis can occur as seborrheic or ulcerative. Seborrheic blepharitis is associated with dandruff. This type typically causes the eyelids to become red and produce waxy scales on the eyelashes. It also may cause the eyes to itch. The scales initially develop due to an abnormal amount and type of tear film being produced by the glands of the eyelids. Ulcerative blepharitis is less common than seborrheic blepharitis and usually begins in childhood. It is caused by bacteria. Ulcerative blepharitis is a more severe form that causes hard crusts to form around the eyelashes. These crusts often become matted during sleep, making it difficult to open the eyes in the morning. Anterior blepharitis can actually put one at risk for developing a significant eye infection while wearing contact lenses because of the amount of bacteria hanging around the eyelid. Plus, the crusty debris can spill over into the tear film and cause irritation and contact lens coating problems. In addition, manipulating the eyelids while inserting and removing contact lenses can cause more debris to be spread around, increasing redness. Posterior Blepharitis: Posterior blepharitis develops when oil glands in the inner eyelid allow bacteria to grow. It can occur as a result of skin conditions such as acne rosacea and scalp dandruff. Posterior blepharitis is also referred to as meibomian gland dysfunction (MGD). Meibomian gland dysfunction is a much more common type of blepharitis. Meibomian glands function to secrete a type of oil. With the force of a blink, oil is secreted into the tears. This oil is designed to prevent tear film evaporation. When these glands are inflammed, either too much or too little oil is being secreted. Posterior blepharitis also causes evaporative dry eye. Having a dry eye can make wearing contact lenses extremely difficult. Fatty acids: Omega-3 fatty acids are shown to stabilize the meibomian glands and create an anti-inflammatory effect on the eye. It may take 3-6 months before a definite beneficial effect is seen. Topical antibiotics: Azithromycin is available in a topical form called Azasite. Doctors will often tell patients to apply a small amount of Azasite to the eyelid margin with their finger at bedtime. Azasite tends to have an anti-inflammatory effect as well as anti-infective. Antibiotic ointments such as erythromycin and bacitracin are also prescribed although they are a little thicker. Oral antibiotics: For stubborn cases, oral antibiotics may also be prescribed. Oral tetracycline, minocycline, or doxycycline prescribed anywhere from 30 days to much longer can be quite effective. This is helpful especially for patients with a more severe form of blepharitis called ocular rosacea. Corticosteroids: Although steroids can bring unwanted side effects and risks, they are very effective at quelling inflammation when more traditional methods do not work. Doctors will prescribe them for blepharitis for short-term inflammation control to minimize potential complications. The most common types of eye allergies are seasonal allergic conjunctivitis (SAC) and perennial allergic conjunctivitis (PAC). These types of eye allergies cause the typical symptoms we are familiar with such as itching, redness, tearing, swelling, burning and white stringy mucus. More severe allergies such as vernal and atopic keratoconjunctivitis carry more risks. While it is not to be said that people suffering from these two types of allergic eye disease can not wear contact lenses, it definitely carries with it more problems, as sometimes these conditions can affect the cornea to a significant degree and even cause scarring. The more severe the allergy, the less likely you will be a good candidate for contact lenses. One treatment of general allergies is to take antihistamines. Antihistamines work wonders for those of us with allergies, but one detrimental side effect is that they dry out the mucus membranes, including those in the eyes. As a result, the eye is dry and dry eyes make it difficult to wear contact lenses successfully. However, today we have very effective medications to control eye allergies, most in the form of eye drops. Steroids, antihistamines and mast cell stabilizers are medications that can be prescribed by your optometrist or ophthalmologist to reduce symptoms. Because allergies can stick to our contact lenses and activate our allergies, one method to reduce eye allergies is for the wearer to be fit with daily disposable contact lenses. These lenses are worn for a day or less and then disposed of. Every day you get a brand new, antigen-free lens to wear. Giant papillary conjunctivitis (GPC) is a condition that is sometimes considered an allergy but is a bit different from environmental allergies. GPC is a condition where the eye becomes allergic to a protein that precipitates out of the tears and onto the surface of a contact lens. The tissue under the upper eyelid becomes lumpy and bumpy and can grab hold of your contact lenses and move them around. People with GPC often complain of irritation and mucus discharge. GPC often develops in people who already wear contact lenses. This condition can usually be successfully treated. Eye doctors have a huge variety of parameters to choose from to fit contacts for patients that not only have nearsightedness or farsightedness, but also astigmatism and presbyopia. Optometrists have great products at their disposal. However, many people expect that they will receive the same quality of vision that they experience with their eyeglasses. Contact lenses do provide a new type of freedom, but for some people they do not always provide the sharpness and clarity that a high quality pair of eyeglasses provides. People with nearsightedness, farsightedness and moderate amounts of astigmatism generally see as well with contacts as they do with glasses. However, high amounts of astigmatism are often more difficult to correct with soft contact lenses. Vision just never seems as crisp as it does with glasses. Although we have contact lenses for correcting near vision problems due to presbyopia, such as monovision and multifocals, there is usually some level of compromise either at distance or near. Custom designed astigmatism lenses by SpecialEyes. Hybrid lenses (part soft; part rigid) by Synergeyes. Clinical Manual of Contact Lenses, Bennett, Edward, Henry, Vinita, Wolters Kluwer/Lippincott Williams & Wilkins, Apr 24, 2015. Can You Afford to Wear Contacts? What Are the Benefits of Wearing Scleral Contact Lenses?